Read Denise McKenna’s co founder of Mental Health Resistance Network (MHRN) response to Rethink’s mail out that termed people with mental health issues as a ‘disease burden’! DPAC fully support our good friends Denise and MHRN in urging Rethink to issue an immediate apology for using this offensive term. 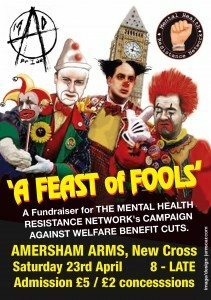 Members of the Mental Health Resistance Network (MHRN) and our friends at Disabled People Against Cuts (DPAC) were included in your mail-out below. We were shocked and bewildered that Rethink thought it acceptable to use the term “disease burden” in relation to mental health in a bulk mail-out. In this context it is brutal language and has caused offence to those of us who live with mental distress and to other members of the disability movement who have received your mailing. “Disease burden” is a specialist piece of jargon used in disease informatics but, even when used in this context, disabled people do not accept that it is neutral. No language is neutral and this term should never have been used in a mail-out to random disabled people. You are no doubt aware that the words “disease” and, above all, “burden” are highly toxic to disabled people and those living with mental distress. It was crass to send this out willy nilly. Is there no sensitivity at Rethink? We urge you to issue an immediate apology to all of the people who received this mailing and rightly experienced it as offensive and hurtful. Today we’re launching A Manifesto for Better Mental Health which sets out practical changes that a future Government must make in order to ensure our mental and physical health are valued equally. We’ve joined forces with our colleagues across mental health to agree on five key areas we are calling on all political parties to commit to if they are elected in 2015. Mental health accounts for 23% of the disease burden, but it gets just 13% of the NHS budget and funding has been cut even further for the last three years. This is not acceptable. The next Government must seriously tackle this issue. Our ‘Manifesto for Better Mental Health’ has been written with the Centre for Mental Health, Mental Health Foundation, Mental Health Network, Mind and the Royal College of Psychiatrists. Together we intend to turn this tide. Our time has come. Sanity in an era of rabid capitalism? A F.E.E.L. (Friends of East End Loonies) occasional event todiscuss abuses within the psychiatric system, what a humane asylum would be like and the wide range of alternatives. There will be an interval with music, poetry and refreshments.No entrance fee but donations will be welcome to cover costs. We need a liberating movement to transform hospitals and Mental Health Units into humane asylums and to demand the full range of complementary and natural therapies including arts therapies (which a study has indicated is more effective than drug therapy) and talking therapy, and an end to pharmaco-custodial control. The Court of Appeal today (4 December 2013) rejected the Government’s appeal against a landmark ruling by the Upper Tribunal that the Work Capability Assessment discriminates against people with mental health problems. During a four day hearing in January 2013, the Upper Tribunal heard evidence from the 2 disabled claimants, from mental health charities, Mind, Rethink Mental Illness and the National Autistic Society, as well as from the Government about the operation of the Work Capability Assessment, and the experience of people with mental health problems going through the process. In May 2013, having weighed the evidence, the tribunal concluded that the process substantially disadvantaged those with mental health problems. This was for two main reasons: first because the application process and the face to face interview can be particularly distressing and confusing for those with mental health problems; and second because of the great difficulty that many with mental health problems have in explaining their condition, which increases the risk that the benefit will be wrongly refused. To remedy this disadvantage, the claimants, supported by the mental health charities and by the Equality and Human Rights Commission, argued that where ESA applicants have mental health problems, the DWP should consider obtaining medical evidence from the claimant’s doctor or psychiatric team at every stage of the process, and if a decision was taken by Atos or the DWP not to ask for medical evidence, this would have to be justified at each stage. This approach followed a recommendation made in November 2012 by Professor Malcolm Harrington, an independent reviewer of the process appointed by the Government. The Government refused to implement this adjustment because it argued that the system did not discriminate against people with mental health problems. As stated above, the tribunal disagreed. It ruled that the adjustment to the process recommended by Professor Harrington might be a reasonable response to the “substantial disadvantage” it had found, and urged the Government to carry out a trial to see if obtaining further medical evidence earlier in the process would make the process better for people with mental health problems. Once the new process was trialled, the tribunal asked the Government to return to court for a hearing about whether – in light of the trial – the adjustment was reasonably necessary. “the Tribunal identified various ways in which [Further Medical Evidence] would assist [people] with a range of mental disabilities, and in my judgment there was sufficient evidence to justify the conclusion that [mental health patients] were placed, as a group, at more than a trivial disadvantage”. For further information contact Ravi Low-Beer on r.lowbeer@publiclawproject.org.uk or 020 7843 1264. The WCA is a face to face interview conducted by healthcare professionals employed by a private company, Atos Healthcare to assess eligibility for Employment and Support Allowance. Approximately 28,000 ESA claims (some 11,000 from existing Incapacity Benefit claimants, and some 17,000 from new ESA claimants) are made each week, around 40% of them by applicants who suffer from mental health problems. The speed and quality of the Work Capability Assessment interviews and the decisions resulting from them have been consistently criticised by disabled people. An application has been made by members of the Mental Health Resistance Network for permission to have a Judicial Review of the Work Capability Assessment (WCA) and a judge has decided that there should be a hearing to decide whether to grant us the Judicial Review. The hearing will happen at the Royal Courts of Justice in the Strand in London on Friday 29th June. We won’t know until the day before what time it will be heard. With thanks to MHRN for letting us publicise this. It is MHRN who have pushed this through, not any big charity -remember most activism is coming from grassroots groups-rather than well funded charities who like to try to claim the credit. Lets support MHRN as much as we can with this great achievement on 29th June-hopefully the first of many challenges to the corrupt WCA…..
Don’t Get Mad Get Political! The new Mental Health Resistance Network is hosting a half day meet for us to get more organized. The Public Law Project has been supporting the Network in trying to get a Judicial Review of the Work Capability Assessment which is designed to get sick and distressed people off benefits. The Network’s solicitor, Ravi Low-Beer, will be speaking about Judicial Reviews. 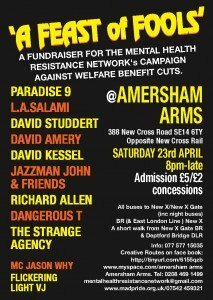 Facing enormous cuts to benefits and services, we mental health Survivors are stressed out bigtime. We find ourselves demonized by the right wing press (again) and the ConDem government. How stupid and cruel politicians of all parties are being beggars belief. Or do they believe we should all be beggars? 12.45 Judicial Review of a the Government policy on changes to benefits, by Ravi Low-Beer (of the Public Law Project). 2.00-3.00 Workshops. Organizing and going to Demos and Direct Action. Campaigning and Lobbying. A new Arts Project themed How We Feel About the Cuts? Networking and Personal Support. The AMERSHAM ARMS is located opposite NEW X BR station, where the East London Line stops and is within walking distance from NEW X GATE BR station, all buses to New X will get you there. It is a short bus ride from Deptford Bridge DLR station. DAVID AMERY – long established performance poet / performance artist – appeared at numerous venues around London and beyond – also known for running events in his own right. DAVID KESSEL – another performance poet with a long established reputation – an original ‘survivor’ poet – much loved and much respected. DAVID STUDDERT – Australian singer songwriter ‘one of the best going around’ – according to the web site of the famous ‘12 Bar Club’ – where he also ran his ‘Backfire Cool’ nights – also known for running other events around various venues in London and playing at innumerable gigs about town. FRAN LOCK – performance poet – building a reputation – her first publication is due out in may – published by ‘Little Episodes’ an organisation that seeks to promote the therapeutic value of the arts and seeks to de stigmatise depression and addiction issues, that she is involved with. DANGEROUS T – off the wall comic performer, well known around the London small gig scene. THE STRANGE AGENCY – another psychedelic prog metal punk outfit, all the way from the wilds of west Wales – fronted by former local personality – well known for fronting innumerable SE London based bands – the appropriately known Mr Craig High – who appeared onstage at the first BONKERSFEST in 2006. JAZZMAN JOHN & FRIENDS – Lewisham based ‘beat’ poet – well known for his many appearances at numerous venues – there is hardly a night goes by when the Jazzman is out gigging – also known for running his own excellent events, including his current ‘Friday Lip’ late night sessions at the nearby ‘Let’s All Hang Together’ shop and community space set up by the Art Saves Lives organisation – Here John is accompanied by some cool jazz muso’s for an improvised set to bring the night to it’s cool conclusion. 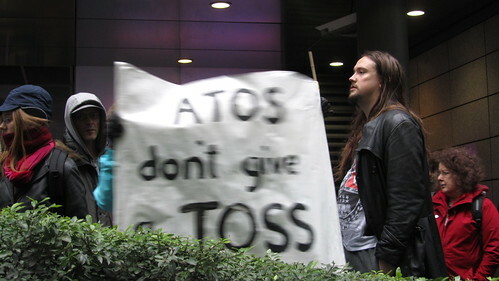 "Atos don't give a toss"
On the last Day of Action Against Benefit Cuts protests, actions and demonstrations were organised in Dundee, Edinburgh, Westminster, Leeds, Liverpool, Bristol, Newcastle, Brighton, Glasgow, Poole, Burnley, Islington, Kensington, Cardiff, Poole and Truro. This time we’ve got all week! Disability activists, claimant groups and anti-cuts campaigners have called a week of action against poverty pimps Atos Origin beginning on Monday 9th May with a picnic and party in Triton Square*, home of their head office, at 2pm. Atos Origin have just begun a £300 million contract by the Con-dem Government to carry out ‘work capability assessments’ on all of those claiming Incapacity Benefit. It is claimed assessments are to test what people can do rather than what they can’t. The real purpose is to strip benefits from as many people as possible. This testing system has already led to people with terminal illnesses and severe medical conditions being declared fit for work and having benefits cut. GP’s are ignored in favour of decisions made by Atos Origin’s computer. Plans announced for the scrapping of Disability Living Allowance have also revealed that this intrusive testing is likely to be extended to everyone on some form of disability or health related benefit. To date around 40% of appeals against Atos Origin’s decisions have been successful. *Triton Square is on the North side of Euston Road, just over the road from Warren Street tube and less than five minutes from Euston/Euston Square or Great Portland Street tube stations.